I like to think I’m not squeamish about menstruation. I track my symptoms every month and am rarely hesitant to talk about periods with close (and even not so close) friends. 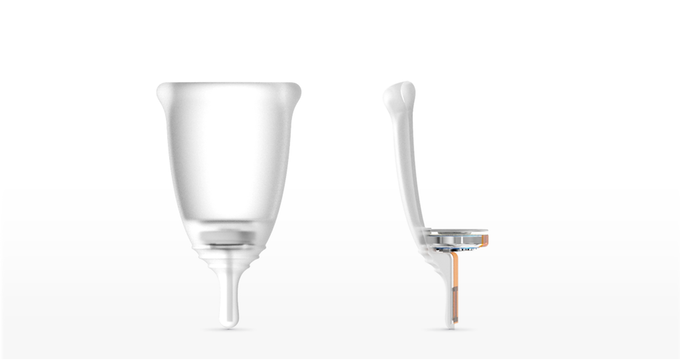 I was still taken aback, however, when I heard about Looncup, which bills itself as the “world’s first smart menstrual cup” and surpassed its $52,000 Kickstarter goal in just one week. Created by Loon Labs, the reusable cup tracks the volume and color of menstrual fluid and uses Bluetooth to send that info to its connected app. Unless it makes a mess, I rarely think about my sloughing uterine lining as anything other than a minor inconvenience, so I asked Loon Labs co-founder Kate Lee about the potential benefits of analyzing it. She explained that changes in the amount of blood and tissue shed can signify problems like uterine fibroids or premature ovarian failure. Since pads and tampons absorb fluid, they can obscure gradual increases or decreases in volume, which in turn might delay diagnosis. Looncup’s sensor, which is embedded at the base of the cup, also serves a practical purpose. Menstrual cups are gaining in popularity–DivaCup, Lunette, and Mooncups are few of the most widely available brands–partly because they can be worn longer than tampons (some manufacturers say up to twelve hours), but they sometimes fill up and leak before then. Lee says Looncup, which currently starts at $30 (about the same as traditional menstrual cups), was originally created to alert women when they need to empty their cup. Looncup’s initial target customers are people who already use menstrual cups, but cup fans might have some quibbles with its current iteration. For example, most menstrual cups come with a handle at the bottom for easier removal, but some users find it uncomfortable and cut it off. You can’t do that with the Looncup because its antenna, which sends data from the sensor to its app, is in its handle. Another drawback is that The Looncup’s battery lasts six months and can’t be removed, so you either have to buy a new Looncup when it dies or accept its fate as a dumb cup (menstrual cups can last about five to ten years, a selling point for people who want to find environmentally friendly alternatives to disposable products). Lee says this is because Loon Labs (which is based in San Francisco, with a research and development office in Seoul) wanted to make the Looncup in one piece for hygiene reasons, but will explore wireless battery charging for future versions and a new placement for the antenna so the handle is optional. The battery is 16mm in diameter, which shouldn’t intefere with the folding techniques most people use to insert their cups. In addition to improving Looncup’s design, Loon Labs also plans to develop features for women with specific health conditions and work on other products, including an ovulation tracker. After Looncups are sent to Kickstarter supporters (its estimated ship date is January 2016), the startup will open an online store with worldwide shipping.